Most consider that using a standalone machine can save the budget because the price per unit is cheaper than the multifunctional office machine. However, with the number of machines that reach dozens or even tens must require more maintenance costs. By simply using a multifunction machine, all the print needs can be missed, so the cost of any treatment can be relatively suppressed because only one multifunctional office machine is treated. According to research conducted by the Astragraphia team, the maintenance budget savings could reach 5-10% even more. Office Multifunction’s machines that have the advantages of multi-tasking services, making all the work for office needs can be done in one machine. Therefore, all work can be more effective and efficient. Starting from the needs of photocopying, printing documents, fax and email, high quality scan until features such as cloud based memory, wi-fi direct until NFC support is available in one machine. 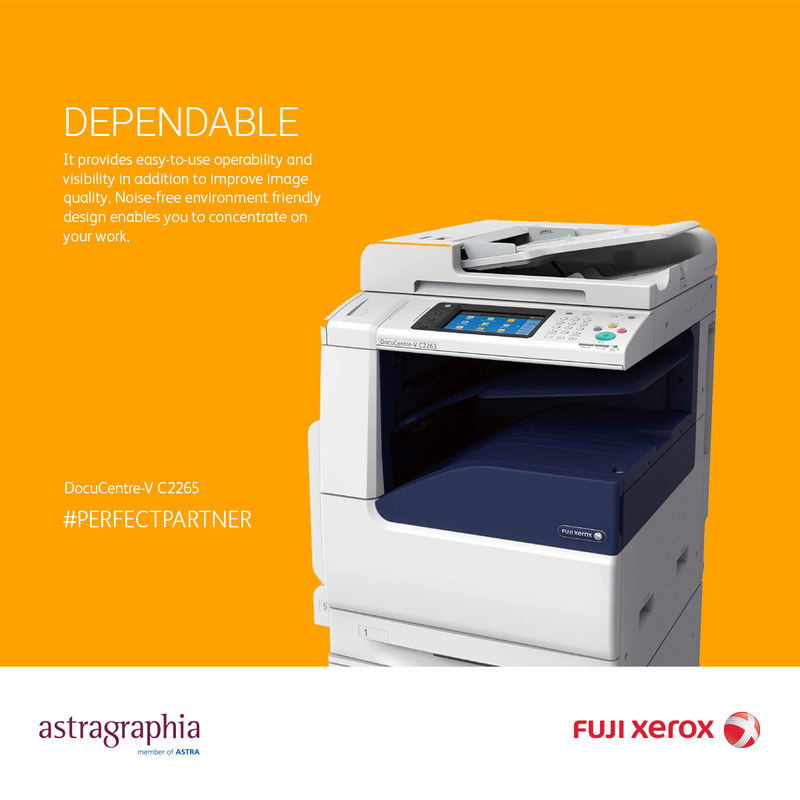 In addition, in terms of reliability of print, multifunctional office machines provide comfort in terms of speed and printouts, for example can be found in the Fuji Xerox DocuCentre-VI C3371 engine, which has a speed of up to 35 ppm (page per minute), with the best print resolution in its class ie 2400 x 1200 dpi. No need to worry for vulnerable warm-up time, Fuji Xerox DocuCentre-VI C3371 production machine is only takes 2 seconds only. If we calculated energy consumption of a dozen or even dozens of standalone machine with one multifunctional office, the use of energy can certainly be more efficient one multifunction machine. Moreover, some multifunctional office machines have been supported with Super EA-ECO Toner, which reduces energy consumption by up to 20%. In fact, Super EA-ECO Toner technology also allows multifunctional office machines reduce CO2 emissions by up to 35%, so not only energy-efficient but environmentally friendly. Do not worry about the benefits to be gained in terms of after sales service. 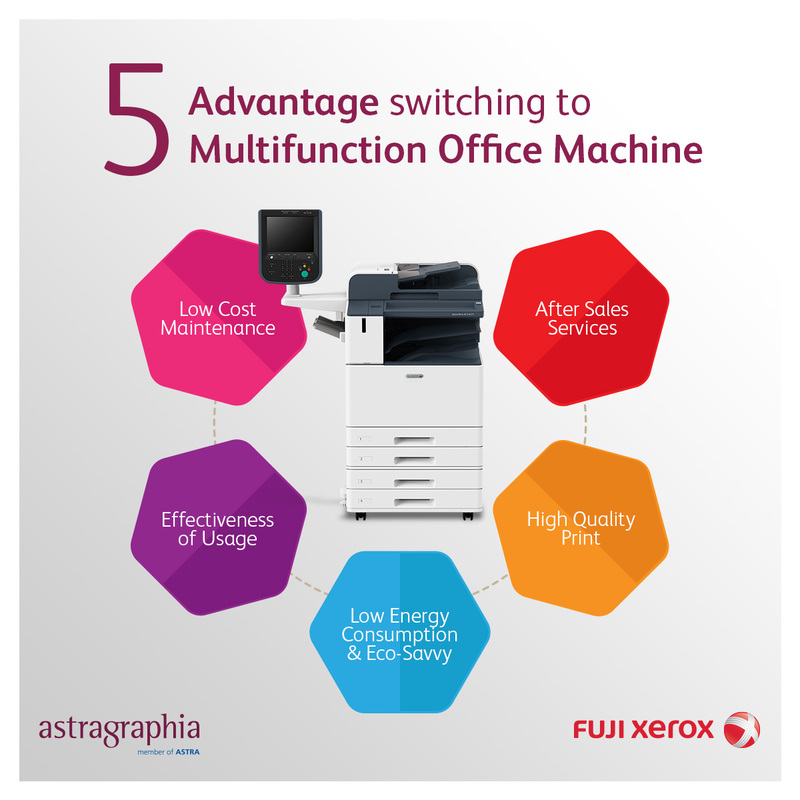 By switching to a multifunctional office machine, the company not only gets the benefits and effectiveness of the machine. But also, get a promising and reliable service. Astragraphia provides Full Services Maintenance Agreement service that can provide convenience for users, if there are technical constraints on the machine, you just call Customer Contact Center Astragraphia in Halo Astragraphia 1500345. This service can be enjoyed for customers who purchase machine or rental transactions. Astragraphia guarantees customers with technicians who can provide 3 hours 'maintenance and 3 hour' downtime. Therefore, for those of you who want a complete package for the benefit and effectiveness of office activities, transition to multifunctional office is the solution. The search for the right photocopy machine doesn’t end when you finally visit the photocopy machine distributor office. There are steps to follow and things to consider. When you choose a photocopy machine, the price will become the first thing to consider. However, you also need to look at its specification. The machine specification is an important part that will help you to choose the ideal product.